FOOTBALL, Hockey, Baseball, and Basketball. 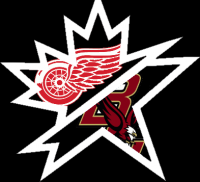 Detroit Red Wings, Boston College, Portland pirates alt., Maine Red claws, Red Sox, Hartford Whalers and obviously Flying Elvis. I had it grey like the other ones, but it just didn't look right with the grey background. I could try a white background, or switch the grey in the wings and make it white. These all look really sweet! The one thing is, on the Halifax one, I think having a green front with a red back might look better. These are great, but I know you don't like having the affiliation patches, but I think they should have them. All AHL teams should. Portland stuff looks amazing! Thanks a lot! I love the current blue and white color scheme, but I wish AHL team would stop using their parent teams template. Have some originality. Thanks a lot. Looks awesome! Looks awesome! The only thing I would add is a affiliate patch in the shoulder like most AHL teams have. The Bakersfield Condors have a thing going on where you can email them name ideas for next year so it looks like they are going to change it up. I love the off-white color. I too eagerly await the portland pirates concept. Definitely should not have a team there. Maybe put a team in New Jersey or in New England.